Our Fax to Email servicesare there for the benefit of our valued customers at no extra cost. Once you have a fax number assigned to you, it is yours to keep for as long as you wish, even if you relocate to a different town or city the fax number stays valid. The service seamlessly incorporates into your email. This means that you can view fax messages and forward them from your email inbox, as long as you are connected to the internet. There is no need for telephone lines and fax machines that often don’t come cheap. The move to E-fax services also reduces your carbon footprint, as you do not need to use ink and paper for printing to send faxes. 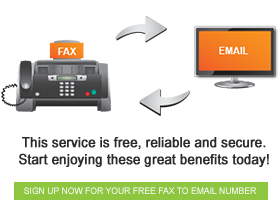 Faxing with FaxFX is very simple; in fact it is as easy as sending and receiving an Email. When you receive the fax, it appears I your inbox as either a TIFF file or a PDF document, compatible with most operating systems. You can view, print or forward your faxes instantly and they are automatically archived.